Posted 2 years ago on Sunday, January 1st, 2017 by James S.
I bought the car with the original 1997 factory ball joints and long-since torn boots. The joints were actually still fairly tight, but I didn’t want to gamble on them for track use. I ended up getting the Moog “Problem-Solver” K500210 Ball Joint . 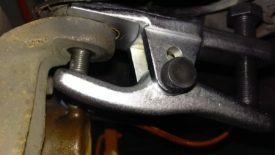 Miata ball joints aren’t supposed to be replaceable; Mazda says to replace the entire a-arm. Fortunately, Moog makes these aftermarket parts. I didn’t take pictures of the actual ball joint replacement, but it’s fairly straightforward. I have a writeup describing how to disconnect the upper control arms from the spindle. 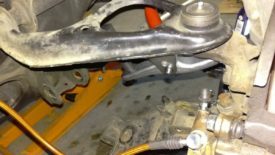 Additionally, you should probably remove the coilovers first, so that you can pull the entire upper a-arm from the car. Once you have both UCAs in hand, you can press out the old ball joint and press this one in. On a related note, I find this style of ball joint separator to work better than a traditional pickle fork at disconnecting the UCA from the spindle. This is discussed in the control arm article mentioned above. You can borrow one of these for free as part of Autozone’s Loan-a-Tool Program. I ended up having one issue with these boots, and I believe it is a design flaw on Moog’s part. 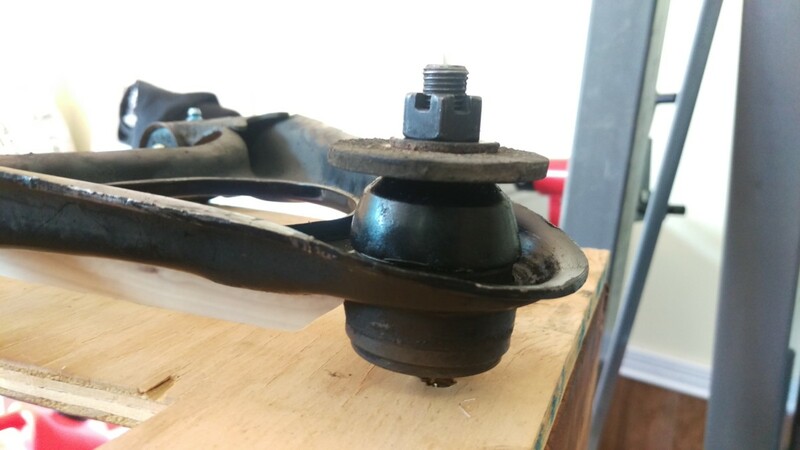 The rubber boots these ball joints come with are too long. They end up folding over significantly during normal operation. No matter how little grease I put in, they would end up wearing through. Fortunately, it didn’t cause a severe tear, but enough to contaminate the grease. 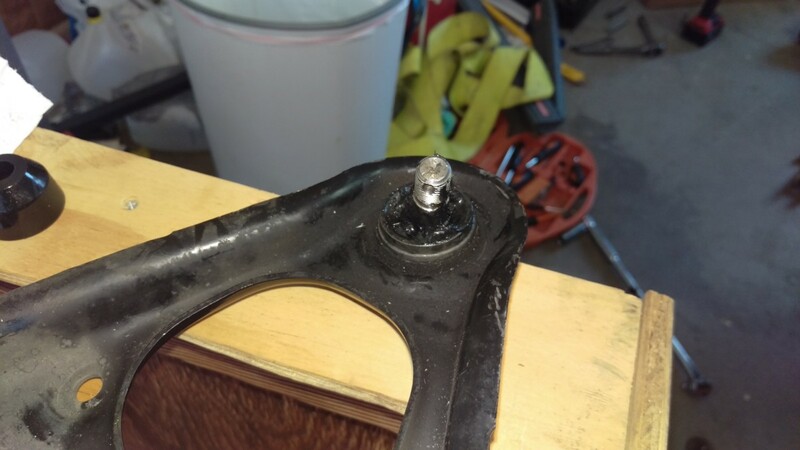 While doing my control arm bushing replacement, I ended up replacing the boot with the polyurethane boot shown . As you can see in the comparison picture, it is a good bit shorter. Being made of polyurethane, it’s also a lot stiffer, so it doesn’t tend to fold over on itself. 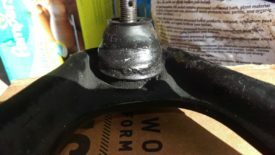 This boot should also be usable if you have a factory boot that has torn, but your ball joint is still tight and in good shape. The potential issue there is that you would have to be sure to add enough grease before putting the boot on, since the factory joints don’t have a grease zerk. In the name of safety, I would strongly suggest getting new joints as well as new boots in this situation. You can replace torn boots in the car. 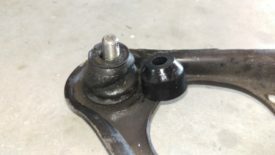 If you’re replacing the ball joints at the same time, you should also remove the control arms and replace the joints, of course. The aforementioned ball joint separator is used as shown. Getting the poly boots on is fairly straightforward. With the arm and spindle separated, you can tear the old boot off. 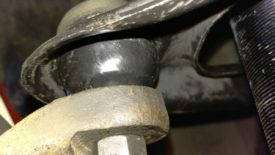 You should double-check that the joint is in good shape if you’re not replacing it. In my case, I had kept it sufficiently topped up with grease. The joint still had plenty of grease in it, and it was still tight. You should be able to move it around without it catching, but it shouldn’t be loose. These boots are short enough that they can easily pop back off the joint until they’re installed. My approach is to press them onto the joint using the joint’s nut and a washer, as shown. I’m not sure this step is strictly necessary, but it does seem to nicely center the boot over the joint. Then, without moving the joint, I put it straight on the spindle and tighten the nut down. Once the boot is squeezed on by the spindle, it is really on and doesn’t come loose again. If you don’t get it on, it can roll under or over and not be installed properly. The Moog problem-solver ball joint is a great way to replace your ball joints without having to spend the money on entirely new a-arms. It seems to only be applicable to 90-97 Miatas. However, I believe the Moog ball joint boot for a Miata has a flawed design. As a result, I would also suggest spending the $8 on a set of polyurethane boots to ensure that the boot doesn’t tear.